Facing financial difficulty is never nice. As the letters and final warning keep arriving at your doorstep, you will no doubt endure a lot of sleepless nights. Quite simply, escaping debt has to be your financial priority. Once you’re in that hole, escaping it can feel like a nightmare. But if you equip yourself with a winning plan of action, there’s nothing to stop you working your way toward a far brighter outcome. You’ll need to master several elements before seeing those outcomes, however. Here are the crucial ingredients that’ll help you achieve those goals. First and foremost, you need to appreciate that actions speak louder than words. The longer you stay in debt, the worse your situation will become. While a little planning is vital, wasting time simply isn’t an option. Desperate times require big decisions, and downsizing property is one option that may unlock a brighter future. Discover how to sell your house fast, and you’ll be able to clear those debts before the interest mounts any higher. In turn, this should allow you to enjoy your future with far greater impact. Apart from anything else, staying in debt will continue to mess with your mind. Take the required action to overcome those problems, and you will not regret it. Facing debt can feel like a very lonely situation. Help is available, however; you just need to know where it’s found. Perhaps the best starting point is your friends and family. Of course, you don’t like the thought of borrowing money from loved ones. As long as you create a solid agreement, though, it can be the perfect way to gain relief. If this isn’t an option, there are other solutions out there. From consolidation loans to government schemes, there are ways to make the process feel less daunting. Simply sharing your problem will give you a better chance of defeating it. So stop trying to fight the battle alone. Creditors aren’t the big enemies you’ve probably painted them out to be. While they have a duty to get their money back, many of them are more than willing to discuss individual issues. However, they cannot allow you to buy extra time if you aren’t willing to open those communications. 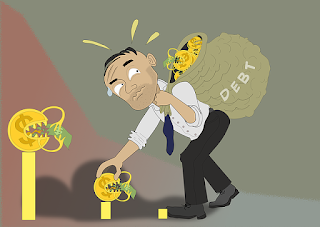 Simply ignoring the debts will result in more aggressive debt collecting tactics. This guide on negotiations should help you prepare for those important talks, and could allow you to buy a little extra time. As long as you’re making the other positive moves, this could make a world of difference. Finally, escaping debt shouldn’t just bring temporary relief. This financial chapter should be the wake-up call needed to implement positive change forever. Otherwise, you’ll find yourself trapped in an endless cycle void of long-term freedom. Use this as a chance to re-think your financial management. By having a tighter grasp on spending and other financial elements, you should avoid sinking back into debt. Meanwhile, you should also try to keep one eye focused on building a retirement fund. Quite frankly, there’s no substitute for knowing that your long-term financial health is looking great. If that’s not an incentive to start acting with greater responsibility, then what is?